On behalf of the Jacksonville Association of Nursing Students, we would like to congratulate you on your acceptance into upper division nursing! You are about to enter an exciting adventure in one of the most awarding professions of all time! 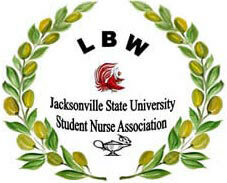 We would like to personally invite you to join our incredible chapter of nursing students and become a member of the Jacksonville Association of Nursing Students (JANS). So, what exactly is JANS? As a student-led organization, JANS plans programs for the student body, along with projects that help serve our campus community. JANS also sends representatives to the state convention of the Alabama Association of Nursing Students each year. At convention, student nurses have the opportunity to work together to improve the profession of nursing and enrich their own personal careers. When you become a JANS member, you are not only becoming a part of our local association, but the state (Alabama Association of Nursing Students) and the national chapters also (National Student Nurses Association)! You are connected with over 50,000 students in the largest student led organization in the United States! -One of the most incredible benefits of joining JANS is that you will now be eligible for the many SCHOLARSHIPS that are only awarded exclusively to JANS members!!! (Every Spring semester JANS will award scholarships). To increase your chances of receiving a scholarship even more, you are also eligible for any Alabama Association of Nursing Student’s scholarship AND…you are also eligible for any National Student Nurses Associational Scholarship. On the day of orientation JANS will extend its membership to the new students. Membership dues are $55 for one year and $85 for 2 years. Dues are subject to change based on national increases. Bring your money the day of orientation. We are looking forward to meeting each of you!